Queensland Health's first preference is for interpreting sessions to be conducted on-site. If an interpreter is unavailable to attend in person, video conference or telephone interpreting may be used. On-site interpreting is Queensland Health's preferred type of interpreting. 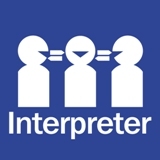 On-site interpreting involves an interpreter attending a health care appointment in-person with the patient and health care worker. Video conference interpreting (or video remote interpreting) involves an interpreter being linked to a health care appointment with a patient and health care workers via video conferencing facilities. More information about video remote interpreting is available, including fact sheets in other languages, information for patients, information for staff and information for interpreters. Telephone interpreting involves an interpereter being linked to a health care appointment with a patient and health care worker via a telephone.